Celebrating the End–or Is It the Beginning? I have a lot of family I guess, even though literally speaking, my nuclear families (by birth and by marriage) are quite small. One of the most amazing families I have is my Seminary of the East family. We got the news that the Seminary was being shut down by the Institution back in October or something, so one of the students got the idea to have some sort of Celebration of our history and of our faculty and staff. I was feeling pretty passionate about the shut-down at the time, so I joined the steering committee for this Celebration project. But then life got super-busy for the next, oh, six months or so, and it looked like another Institution was going to pick up our Seminary and keep it going, so the nature of the Celebration suddenly seemed different, and then it turned out the Institution wasn’t going to pick us up after all, so that changed the Celebration back–only kind of worse, because now we were being shut down and turned down–and I got a little bitter again, but also kind of resigned, so that by the time that news broke, I just kind of wanted to fade away and forget the Celebration altogether. What happened was that I ended up forgetting all the conference-call planning meetings instead. It wasn’t consciously on purpose, but I do have this ignoble characteristic of forgetting things I just plain don’t want to bother with–like the brief period of time I worked as a paralegal’s assistant and had to be reminded at the end of every month how to compile a mortgage package. I felt really guilty every time I realised (usually a couple of days later) that I had forgotten another meeting, but somehow I still kept forgetting them, and I’ve got to be honest, I really didn’t feel like going to the Celebration last night at all. But I did and now I just have to say I’m so glad my fellow student had that idea and that everybody else was a better steering committee member than I was and that I was still allowed to attend after being such a slacker. But of course I was, because I cannot reiterate enough how gracious my Seminary family is. They were gracious enough to still include me as a steering committee member, for one thing, but mostly I’m talking about everyone’s attitude to this shut-down situation. It’s clear that we’re all disappointed. Heartbroken, even. There were and have been some very, shall we say, human reactions as we process the implications of this shut-down. But somehow still, it was a Celebration–of what God has done in and through the Seminary and its people for the last 30 years, and of the faith that some Institution might shut down the Seminary itself, but that God isn’t done with us yet. It was a Celebration of God’s goodness, and an act of trust that He is in fact good, and that we as individuals, and maybe even yet as a community, have a future. As it happens, our professors got reinstated temporarily to teach distance courses for the Institution, and many of us are staying on to complete our programmes and graduate. 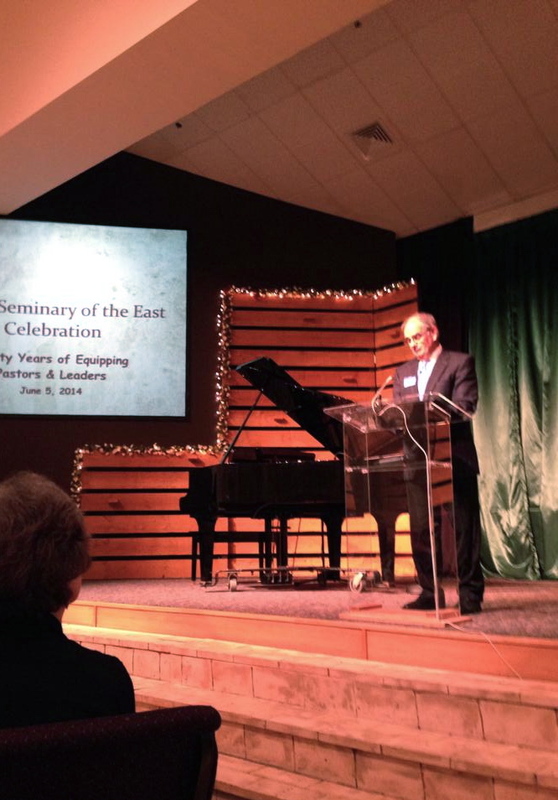 Also in the fall, some of the faculty plan to start a New England Center for Christian Study. Same people, same place, only now–even though you can’t get a degree–you don’t have to have a college education or even be planning to go into “full-time Christian ministry” to get this kind of close community of “head-heart-hands” learning. (It strikes me that this might, however, be an excellent way to get one’s feet wet and discern if some sort of ministry isn’t in the cards sometime down the road.) This center doesn’t have to do with me (yet), but I think it’s a great idea, and I’m kind of excited. Mostly I was once again blown away by the spirit of humility, faith, hope, joy, and love in that room last night, as people shared and reminisced–publicly and with their friends. Probably if it were a community full of grumpy people like me, it wouldn’t even have happened. But one of the best things about this Seminary was these inspiring Christ-like people who showed each other what grace really looks like. Yes, you’re absolutely right . . .